Being named the "best" of anything can often be misleading and result in unrealistic expectations. So when AnnaLena was designated as one of En Route's best new restaurants in Canada, we didn't pay much attention. Besides, past winners have not really lived up to the hype. 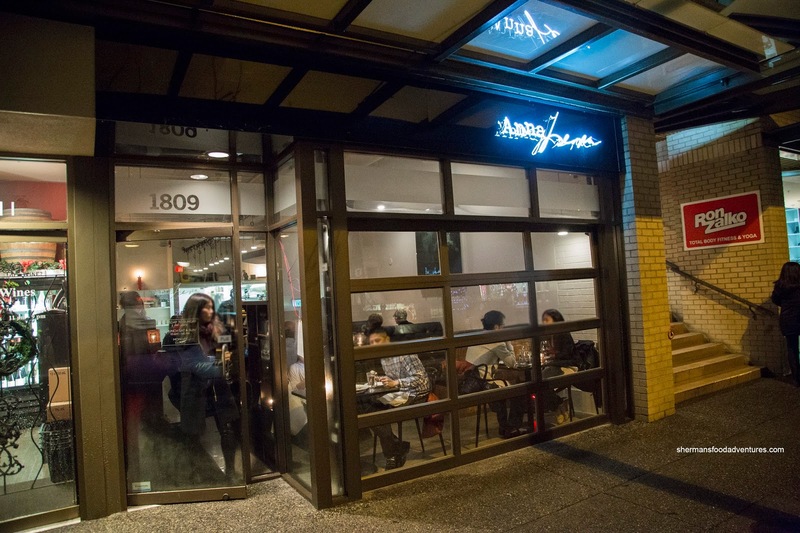 Yet as time went on, we were hearing heavy praise for Michael Robbin's new venture in Kitsilano, situated in the former Kits Daily Kitchen. Oh all right, I guess we had to check it out for ourselves, along with Elaine and Costanza. 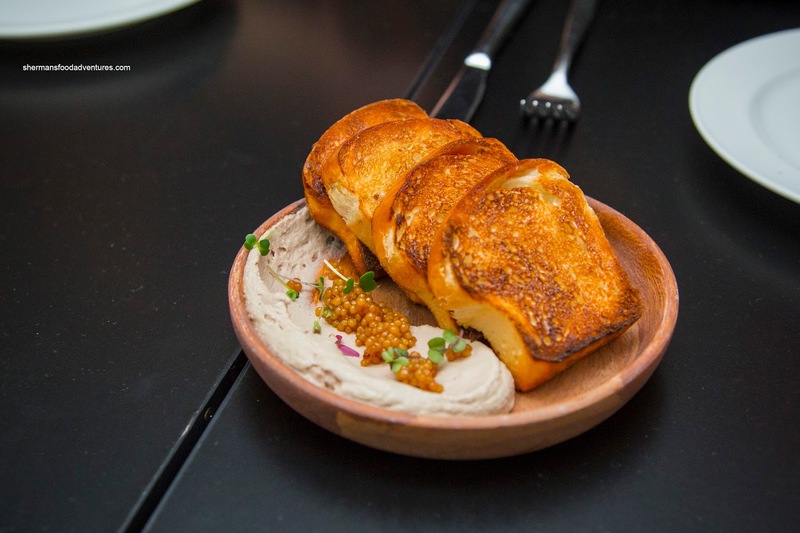 With a focused and simple menu, we were able to try nearly everything including the Chicken Liver Pate with pickled mustard seeds and grilled bread. As evidenced in the picture, the bread was toasted to an appealing hue. It was crunchy albeit a bit dense. We found the pate to be creamy and light while mildly flavoured. There was a hint of cognac to go with the slightly tart mustard seeds. One of our favourite dishes of the night was the second being the Grilled Octopus with fingerling potato, sauce gribiche and lobster mayo. If there was ever an example of balance, this would be it. 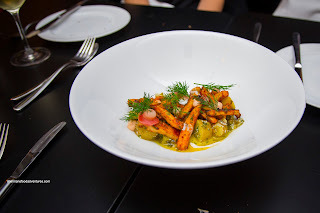 The dish hit every note including the saltiness of the capers, tartness from the pickles, the savoury sweetness of the perfectly prepared octopus, a touch of spice and the umami from the lobster mayo. Textures were on point too where the octopus was tender with a bite and an appealing crust. 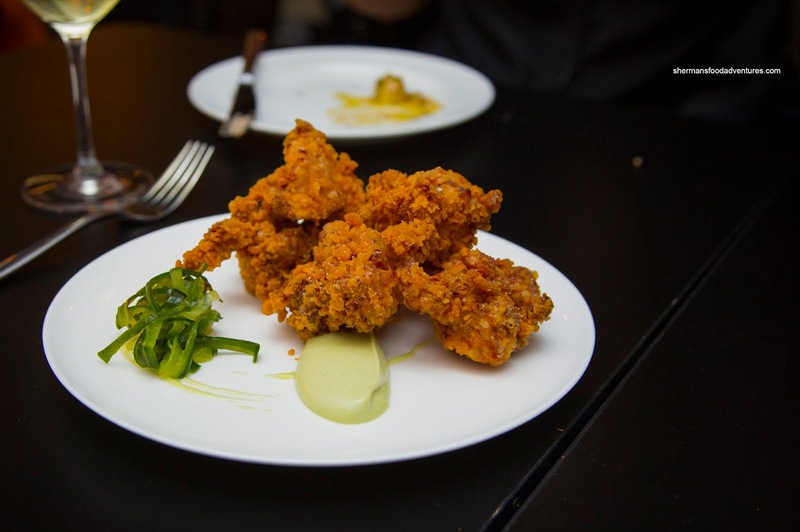 As simple as the Buttermilk Fried Chicken appeared on the plate with maple wasabi mayo and pickled vegetable, it was fantastic. Crunchy while still light and airy, the crust was appealingly seasoned where it wasn't greasy. Inside, the chicken was succulent and well-seasoned from the brine. It was good on its own and really didn't even need the mayo, which was sweet and only mildly hot. 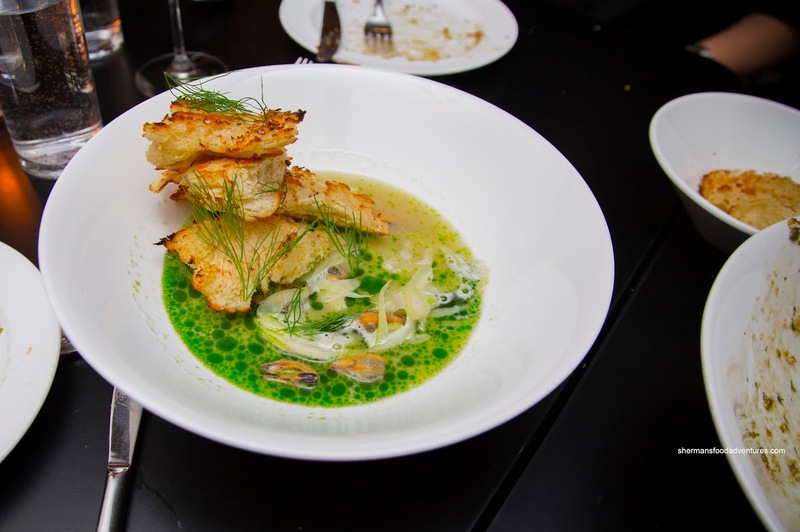 Following up the fried chicken were the Mussels served out-of-the-shell in a white wine fennel broth with braised garlic, thyme oil and torn bread. This was very subtle-tasting dish that benefited from the aromatic thyme oil. However, we didn't get much of the sweet brininess associated with mussels. We would've liked to see them prepared in-the-shell instead. The braised garlic was purposefully mild while the torn bread was soft, slightly chewy and nicely grilled. 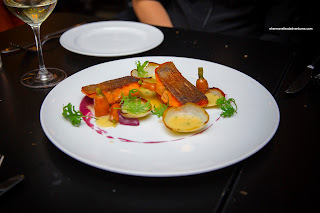 Onto our bigger plates, we started with the beautifully plated Seared Trout with chive butter in charred onion cups, roasted carrots and pickled cabbage puree. Blessed with super crispy and a bit salty skin, the trout was flaky, moist and lightly seasoned. Creamy, salted and sporting a touch of acidity, the chive butter went well with the trout. The carrots were not merely a garnish as they were caramelized exhibiting a firm tenderness. 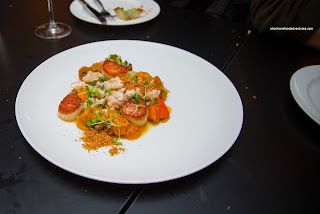 When we first laid eyes on the Seared Scallops, we remarked that there were a lot of things going on with the plate. In fact, there was with glazed veal sweetbreads, mushrooms, fresh sheet pasta, mushy squash and garlic brown butter crumb. Although the scallops were beautifully seared and seasoned, they were just a smidgen overdone. After that, we felt the dish was generally one texture with the tender sweetbreads (with a bite though), mushy squash and soft mushrooms. Flavours were mostly sweet except for the fantastic garlic brown butter crumbs. 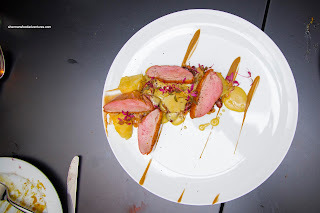 From seafood, we moved onto the Roasted Duck Breast atop coffee celeriac puree, remoulade, farro, beans and foie gras cream. We figured that the duck was brined as the seasoning penetrated the tender meat. The well-rendered and crispy skin was a tad salty though. However, there were enough complimentary flavours to take away from the saltiness. 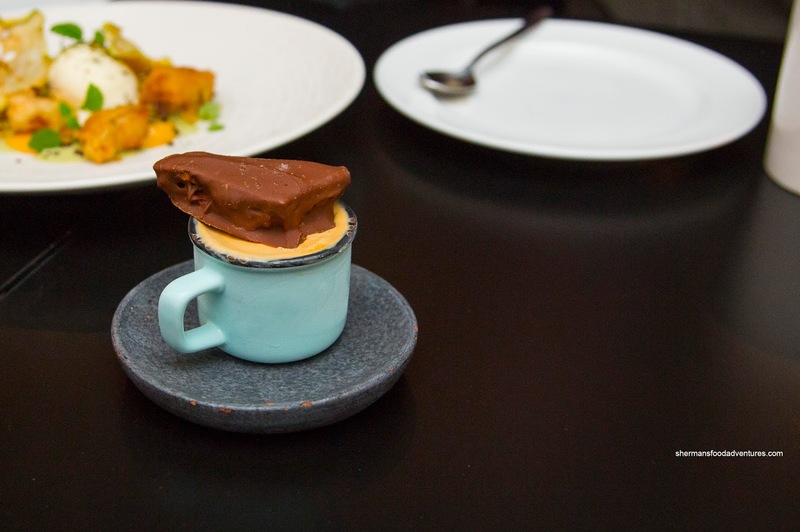 I thought the puree was genius with the aroma of coffee while the foie gras cream and remoulade softened things up with a subtle smoothness and slight acidity. Now for the best dish we had for the night (and in recent memory) - Wagyu Beef Short Rib. Sous-vide for 42 hours and then seared, the pieces of meat literally (and I'm not exaggerating) melted in our mouths. In addition to the exterior seasoning, the meat itself was naturally flavourful from the fat content. It was so rich and addictively foodgasmic. The peppercorn jus was subtle enough that it allowed the meat to do its thing. 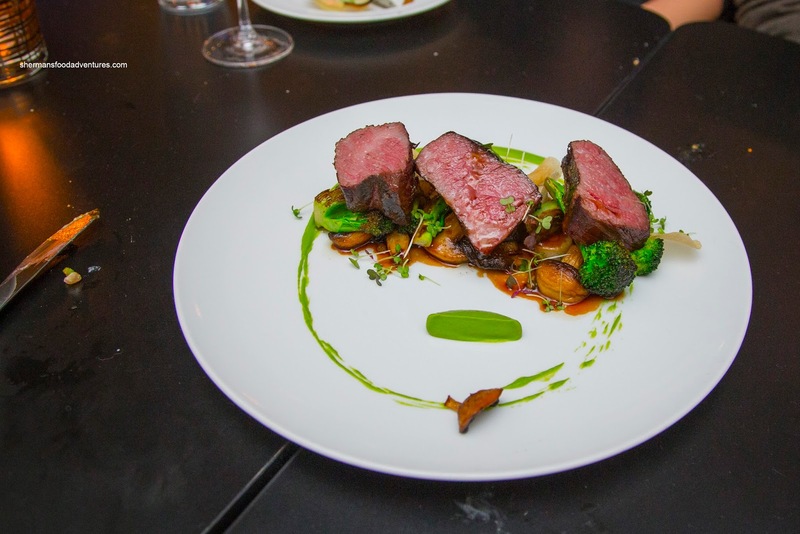 Underneath, the broccoli puree with seared broccoli, mushrooms and potato were expertly prepared - on point textures and not over-seasoned. As for the sweets, we were pretty full, so we shared 2 including the Fried Apple with ice cream, cinnamon sugar, apple chips, crushed pistachios, passionfruit puree and matcha. I enjoyed this dessert as it had lots of things going on, but it all worked in harmony. 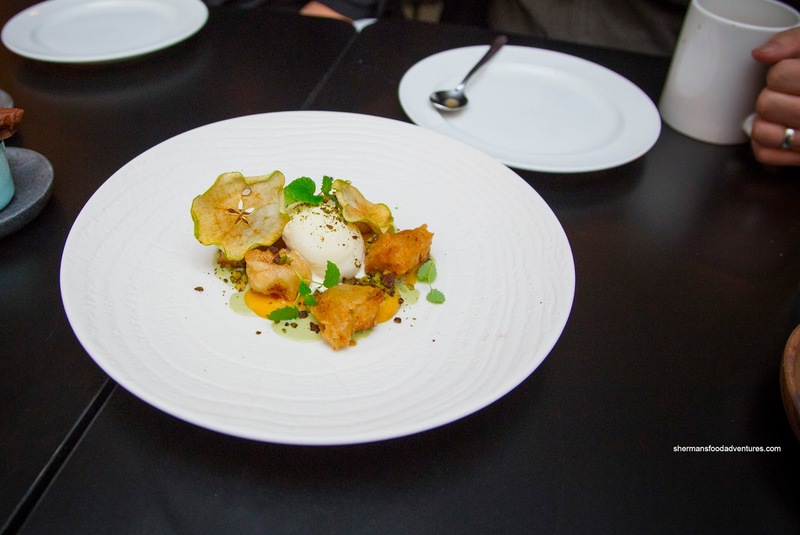 The crunchy batter of the fried apple revealed tender and tart chunks of Granny Smith. The sweetness of the ice cream and passionfruit (as well as some more zing) provided even more impact. Cute and served in a small espresso-sized cup, the Salted Caramel Ice Cream was creamy and on point. There was a rich and smoky finish to the initial caramelized sweetness. On top, there was a chocolate-covered honeycomb crunch that was a very worthy compliment to the ice cream in terms of texture and overall taste (as it fit the theme). Okay, if it appears that we were impressed with our meal, that is completely correct. Out of the 10 items we ordered, 8 of them were very good to excellent. 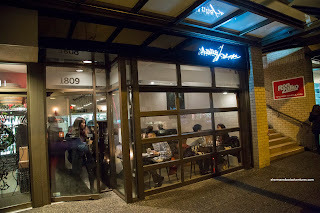 Considering the reasonable price point and fabulous service, AnnaLena deserves being recognized as one of the best new restaurants in Vancouver.